Here’s how to elope. Everything you need to know about elopement wedding dresses, the best places to elope, and elopement packages that will take care of all the details of your surprise wedding & make it the destination wedding of your dreams. 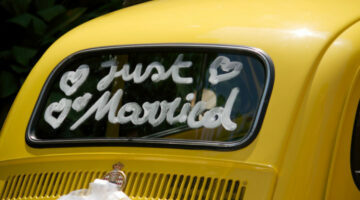 Decorating the wedding car is definitely a fun and creative way to honor (or even embarrass) the newly married couple!. If you’ll be helping to decorate the couple’s wedding car, here are lots of fun ideas for you — including photos of all the best wedding car decorations & supplies to use! Bridesmaid dresses are notoriously ugly, expensive, unflattering, and impossible to wear again. Here’s how to choose dresses that you AND your bridesmaids will love! Want to look best in your wedding pictures? Here are 7 simple things you can do to help your photographer – so you’ll look picture-perfect in every photo! A List Of All The Best Green Wedding Ideas That Save The Planet’s Resources… And Save You Money! The best green wedding ideas for you wedding invitations, wedding confetti, wedding dresses (your gown and your bridesmaids’), wedding rings, and MUCH more! Not a flower person? Looking for something more creative and unique than flowers for your wedding bouquet? These DIY wedding bouquets will inspire you! Divorce Parties: They’re Not For Everyone, But Chances Are You’ll Be Invited To A Divorce Party One Day! A divorce party is a great way to achieve closure. But did you know that many divorcing couples have divorce parties TOGETHER without bashing one another? Did you know that you can become an ordained minister online? Confirmation is usually received within 72 hours. It’s FREE, quick, effortless, and legal! Here’s how to become an ordained minister online. Finding the perfect wedding dress is an exciting and sometimes confusing experience. In the end the perfect dress will find you, especially if you follow these helpful wedding dress shopping tips. Wedding gifts for the parents can be simple or extravagant. This list of adventure gifts for parents of the bride and groom will give you lots of unique ways to show your appreciation! The following wedding party gift ideas are sure to make any of the girls in your wedding party smile. Whether you’re looking for something special for your Maid of Honor or for the bridesmaids in your wedding, these thank you gifts show how much you cherish their friendship and appreciate their role in your wedding. One famous couple’s DIY green wedding ideas + some of my own rustic wedding ideas for a simple, nature-centered event. Photos & videos for a green wedding. Wondering how to make wedding decorations yourself? Here are LOTS Of great ideas to get you started! The Knot, one of our favorite wedding sites, is having a major 3-day sale through Wednesday! Don’t miss out… You can save up to 75% storewide. 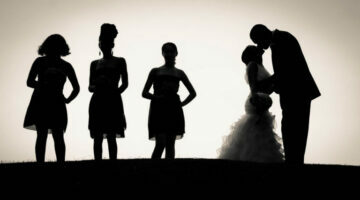 Wondering how you’re going to find someone to perform your wedding ceremony? Here’s what you need to know about marriage licenses to ensure that you will be legally wed in the United States — and abroad — plus tips for finding a wedding officiant yourself. These funny wedding videos show lots of fun ways that you can incorporate social networking sites like Facebook or Twitter into your own wedding. Want to explore some unique beach wedding locations? Check out our personal favorites when it comes to beach weddings — both, in the U.S. and beyond. If you want to look your best on your son or daughter’s wedding day, but you’re not comfortable wearing a lot of makeup, follow these very basic tips — specifically for the mother of the bride or groom. They say that you shouldn’t spend less than $50 on a gift for the bride and groom. That is, unless you don’t know them well or you simply cannot afford it. With that in mind, following are some one-of-a-kind wedding gift ideas for the bride and groom. Trying to find the perfect bride and groom gift for the couple? Perhaps you don’t know them very well. Or maybe you just want to get them something really unique that’s not on their wedding gift registry. Here are some one-of-a-kind gifts that the couple probably hasn’t seen — even heard of — before! Does the idea of having a rainy weather wedding upset you? Are you watching the weather channel 24/7 and it looks like rain may ruin your outdoor wedding? Don’t let rain wreck your wedding, there are steps you can take to prevent this from happening. How to Plan Your Dream Wedding: Think Outside The Box!